Youngsters often start playing sports because their parents have an interest in it. They may see their mother or father watching a game on television and become inspired, or their mother or father may decide that they will benefit from this type of activity. If the youngster has fun while playing, it can lead to a lifetime of enjoying athletics. Regardless of the starting point, there are many values that can be learned by participating in sports. Youngsters and older players can learn the value of work ethic by playing sports. It's not just getting out on the field, court or ice and playing the game. You have to go to practice several times per week to learn the skills needed to play the game well. Players who work hard get better at their chosen sport, and the results show as a season progresses. For example, a baseball player who takes batting practice every day likely sees an improved swing and more productivity at the plate in the second half of the season than he did early in the year. A player who does not work as hard may not see the same kind of progress. You also have to learn to work and play with others to get the most out of the experience, even if you are not always given credit on paper. In basketball, a player who passes the ball to a teammate who scores gets an assist on the play. However, another teammate who sets a screen to give her teammate an open shot won't get any statistical recognition. The teammate who took the open shot knows why she was able to shoot without a defender getting in her way. The coach also appreciates the player who did the hard work and set the screen. At a certain point in the season, players likely see their team progressing and also see improvement in their own play. They realize the progress is the result of hard work. Players have every reason to take pride in their achievements and feel some self-respect for the way they have improved. They also realize that the team on the opposite side of the field is practicing and playing just as hard and deserving respect, as well. 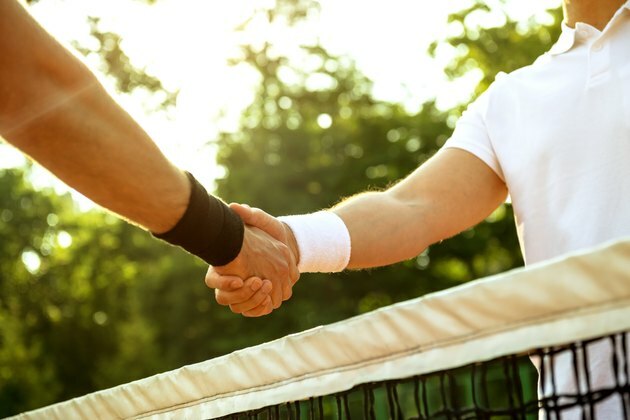 Showing respect for your opponent leads to displays of sportsmanship. That's a sign of maturity and development. When a player strikes out three times in a game, it's easy for that player to feel sorry for himself and want to quit. However, in competitive sports, nearly all players have negative outcomes from time to time. The growth comes from the player who has the bad day, accepts it and keeps playing and attempts to get better. When you overcome adversity, you learn that life isn't always easy and it's best to stay with difficult tasks and conquer them rather than take the easy way out.